The 2015 Justice Served Awards honor each of these nominees for their commitment to a safer, more just America. Tell us which story moves you the most (see our nominating criteria below), and we’ll enter you into a drawing for a free subscription to Consumer Reports. Dr. Stephen Loyd helps other doctors overcome addiction. Dr. Stephen Loyd knows a thing or two about drug addiction among physicians and other health care workers. The prominent Tennessee doctor of internal medicine started taking narcotic painkillers to relieve stress during his residency. By 2004, he was knocking back nearly 100 pain pills a day. “I worked impaired every day. Looking back, I shudder to think what could have happened,” he says. Turns out Loyd is not alone. A recent investigation by USA Today found that more than 100,000 health care workers abuse prescription drugs and alcohol, many while on the job. Loyd broke out of his addiction and today is leading a national effort as an Advocate for Action with the White House Office of National Drug Control Policy to prevent prescription drug abuse among other doctors and health care workers, including implementation of mandatory drug testing. “We have failed at policing ourselves,” said Loyd in this interview. When she took up swimming at the age of 12, Amy Van Dyken’s asthma made it difficult for her to swim the length of the pool. Undaunted by those who said she would never swim competitively, she went to Atlanta in 1996 and became the first American woman to win four gold medals in one Olympics. Four years later, she added two more gold medals at the 2000 Olympics. After retiring from the pool, Van Dyken and her husband, Tom Rouen, a former punter in the NFL, built successful careers in sports and real estate. Fast forward to June 2014 when Van Dyken-Rouen was thrown from the ATV she was riding near her vacation home in Show Low, Arizona. The crash dislocated her T11 vertebra in the middle of her back, paralyzing her from the waist down. But once again Van Dyken-Rouen would overcome the doubters in her life and mount an amazing recovery with the support of family, friends and fans who call themselves Amy’s Army. 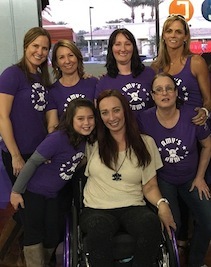 Just six months later, Van Dyken-Rouen launched the Amy Van Dyken Foundation and now uses her star power and Olympic determination to help raise money and awareness for people with spinal cord injuries who cannot afford badly needed medical equipment. Our next nominee quietly wielded the power of the pen to send shock waves rumbling through the medical establishment. The Institute of Medicine (IOM) published the report To Err is Human in 1999, estimating that up to 98,000 Americans die each year as a result of preventable harm in hospitals. As shocking as the IOM data were, Dr. John T. James, using recently published data and a more complete definition of preventable harm to include errors of omission and hospital-acquired infections, estimated in a recent study that 210,000 to 400,000 patients die from medical errors annually. That puts medical errors as the third leading cause of death in the United States after heart disease and cancer. Sadly, the tragedy of medical mistakes would also visit Dr. James. In the late summer of 2002, James’ son John Alexander James, 19, “died as a result of uninformed, careless and unethical care by cardiologists at a hospital in central Texas,” according to his father. As the founder of Patient Safety America, James is dedicated to providing information to those who are concerned about the quality of health care in America. Reggie McKinnon always wondered how a “good parent” could forget their child in a hot car. But then the unthinkable happened. On the way to daycare, McKinnon’s 17-month-old daughter Payton Lynn slept so quietly that he forgot she was even in the back seat. There he found the lifeless body of his baby girl when he returned to his car after work, still in the car seat he strapped her into that morning. This article appeared in our August 2015 "You Should Know" e-newsletter.